This comes with everything needed to install stainless steel lines and AN fittings to your methanol injection system. 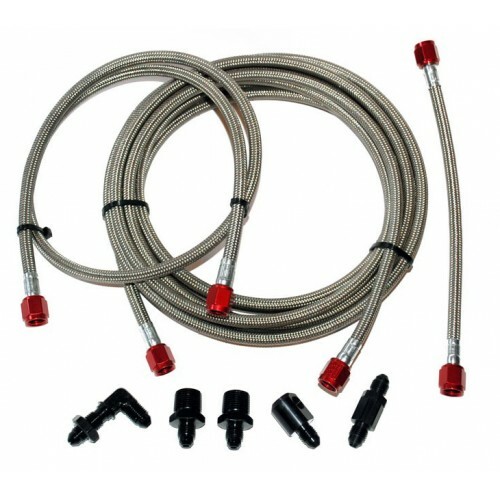 Kit comes with metal bulkhead fitting for the tank, 2 x 3/8Npt to -4 AN fittings for the pump, upper pump housing assembly featuring female 3/8Npt, -4 AN check valve and -4 AN nozzle holder, 3 x Stainless steel lines 180" + 36" + 8" lengths. This is for a complete set. The Progressive Controller from DevilsOwn is by far the latest technology this company has made thus..